Prime Minister Ranil Wickremesinghe on Tuesday assured to rebuild the economy that tumbled over the past 53 days, while insisting that stabilising the rupee was a key priority of the Government›s agenda to provide equitable living standards for all citizens of Sri Lanka. “One of the key concerns of the country today is to stabilise the fast-depreciating rupee, which is affecting the livelihood of the people with a high cost of living. Economic management is not an easy task that everybody can do, and we saw the repercussions of bad management during the past 51 days. Considering all these factors, it is important that we take quick strategic actions to rebuild the economy at a faster pace,” he said, speaking at the opening of the ‘Fiftykay Orchids’ restaurant at Waters Edge in Battaramulla on Tuesday. Wickremesinghe claimed that as a result of the hasty decisions taken by the Government to defend the rupee, foreign reserves, which stood around $8 billion during the August and September period, have dropped drastically due to bad economic management over the past 53 days. “To defend the fast-depreciating rupee, the Government spent more money, and as a result the foreign reserves were reduced further,” he pointed out. Prime Minister Wickremesinghe said the Cabinet has discussed with the Finance Minister on timely policies to strengthen the rupee, which is affecting the livelihood of people. “We have discussed about possible steps that can be taken immediately to mitigate further depreciation. We are even ready to reach out to our friendly countries to borrow money, but that alone will not be sufficient. We must increase our value-added exports and offerings in the tourism industry to generate foreign exchange. 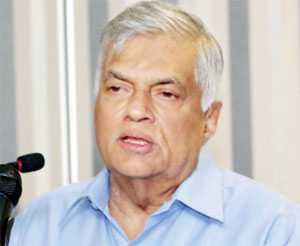 This is why SME enterprises, such as orchid cultivation, should be encouraged, to increase economic activities and circulation of money, for better living standards, for equitable growth,” Wickremesinghe added. He also said that the Government was fully committed to develop the tourism industry, and the authorities have already embarked on many initiatives. «We had many plans scheduled to be launched in November last year, but unfortunately all those plans went into limbo because of the political instability. However, we are now determined to start from where we have stopped those projects,» he assured. Wickremesinghe reiterated that the proposed strategies in consultation with the private sector of the tourism industry stakeholders will be implemented accordingly in the near future. In addition, the Premier said initiation of all the major projects to transform Colombo into a mega-city has been done over the past two years, and the work has already begun on projects such as the LRT, refurbishing of Kelaniya bridge, and Port City, which will come up within the next five years. The Prime Minister also commended the Waters Edge Board of Directors for turning around the company into a profit-making hotel.